Last week, I received a secret message from my Junior Aquabat Decoder Ring informing me of an imminent phone call from MC Bat Commander, the leader of the world’s greatest superhero team/musical group, The Aquabats. He informed me that the Hub Network had been authorized (with a certain amount of help from The Freedom of Information Act) to chronicle the team’s adventures in the new series, The Aquabats! Super Show!, which premieres tomorrow morning at 11am on The Hub. No sooner had I begun to process this information when I discovered a package disguised as a hamburger on my desk. Within was a DVD containing two of the team’s adventures. I locked the doors, and slid the disc into my computer. Approximately 43 minutes later the phone rang and a pleasant gentleman named Christian Jacobs offered to discuss the series. It turns out this guy is claiming responsibility for The Aquabats, and insisted he also co-created Yo Gabba Gabba. I humored him, and listened to his tales (like he used to be a child actor and actually knew Sally Struthers). But, at the end of the call he revealed a secret to me, one that he said I could share only with trustworthy FOG! readers. Christian Jacobs is MC Bat Commander! After the jump, read the interview between myself and the genius behind one of the greatest superhero teams in the history of the universe! What is the secret origin of The Aquabats? The secret origin of The Aquabats. Not the real one? You want the secret one? The secret one. I think the Aquabats have gone through several origin stories and different incarnations. The legend has it that we are from a distant island and that we had to escape our island when it was taken over by a mysterious force from outer space and we—it’s kind of like in reverse, but we found our way into civilization and to try to recruit people to go back and free our home islands. But that storyline—that origin—has kind of morphed and changed over the years and that is definitely clear from the television show—from the Super Show!—that there’s not really a clear origin and it’s kind of murky. So I think in being a show that’s kind of almost a superhero spoof show, we’re satirical on the whole superhero genre. We toyed around with different ideas of where The Aquabats come from and every one of the Aquabats’s recollection is different on where we came from and how we became a team. Even in the opening episode, you see Crash McLarson as a child. In his memories, he is dressed as an Aquabat already. So I think the origin stories will play an interesting role in the upcoming episodes in the future. I think it’s fun because we get to play around with the conventional ideas of being a superhero and the conventions of origin stories themselves. We’ve been around for so long, it’s almost like we forgot where we came from. I know that the series has been in the works for over a decade. How has the finished product changed from the initial idea over a decade ago? I think we’re a lot closer to the original idea of the show than we’ve ever been. And that’s because we did a few pilots and we never really ever had the budget or the means or the resources to get close to what we wanted to do and, and I think this is the show now that we’ve always—at least me, I’ve always envisioned the show being more like this than anything else. And there are, in fact, a few different pilot incarnations We did a few, two pilots and a demo, so those were all variations of the idea like little pieces of the big picture, but I think this is really close to the idea that I originally had in my brain and that was single camera, very cinematic and very campy. The Aquabats Super Show! has bright colors and crazy monsters, and wacky dudes trying to make sense of their lives. You co-created, Yo Gabba Gabba, which although it’s geared for younger viewers, it really has an all age audience. Do you think that The Aquabats are kind of the next step toward an older audience? I think so, yeah. I think 6, 7, 8 year old graduates of Yo Gabba Gabba! will transition really well into this show. I do think there are some scary elements and some violent elements of the Aquabats Super Show! that—I don’t feel are that appropriate for kids under the age of 6 especially without some parental guidance. My two year old watches the show and it kind of freaks him out, so we don’t let him just watch it and we’re real careful about how he views it. Just some of the rough stuff I’ve shown to my own kids. But I think, yeah, it’s a natural transition from kids that have graduated from Yo Gabba Gabba! and they’re maybe not as into it anymore. We found with Yo Gabba Gabba! there seems to be a little bit of a dead zone and that’s between the ages of 6 and 12. It seems like that’s the area where kids are like, “Oh no, preschool shows, that’s a baby show! No thank you!” and once they get into middle school or junior high school, then they’re starting to listen to music more and they kind get the hip sensibilities of Yo Gabba Gabba! But there is that dead zone there, and I think The Aquabats will fit really nicely into. But even beyond that 7 to 12 year old range, I think there’s—adults will like the show and college kids will like the show, and I know younger kids will like the show because my younger kids like it, too, but it does freak them out a little bit. Scary monsters and stuff. The Aquabats, the band, started as this pop, punk hybrid and now, obviously with the show, it’s kind of hitting a younger audience. Was this a natural progression or a conscious decision for the band to kind of shift its—its tone even a little bit toward a younger group? So I think finding this demographic, target demographic, I think that’s just—that’s just the target age, but we were really targeting all ages. And similarly within shows like Spongebob or Adventure Time, they have a target audience—an age group, but I love those shows, too. 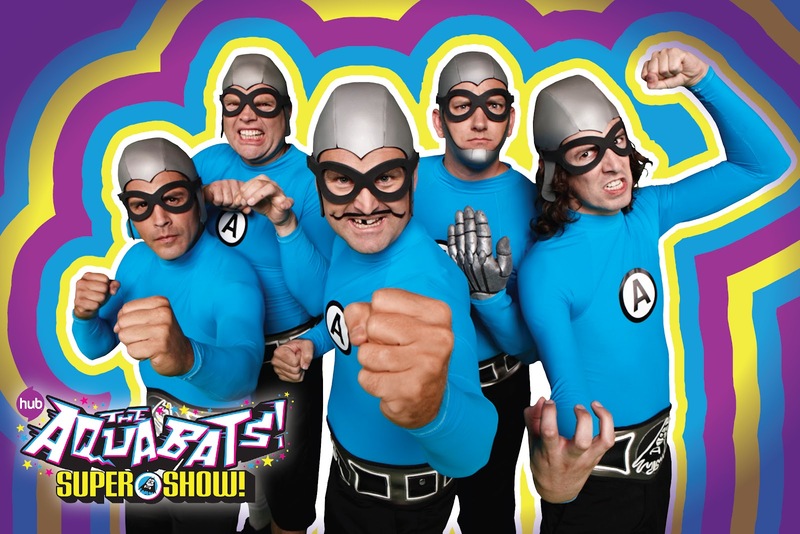 I watch those shows and have for years and years until I came up with the idea for The Aquabats. We don’t have a target demographic, but really, it’s intended for everybody and we’ve always meant to do that in all of our albums. I think probably just our first album was the album that we weren’t thinking that consciously like, “This could work for kids,” but since our first album, I think we’ve always had that in mind. On The Aquabats, it feels like your influences include Ultraman, The Monkees, Sid and Marty Krofft shows and Pee Wee’s Playhouse. What is it about those specific aesthetics that you found inspirational or influential in your work? I think it’s that kind of Golden Age of television. For someone that’s a little younger than me, that maybe was a kid in the early ‘90s, or late ‘80s, their points of reference and the things that things that they have affinities for, I think would be different than mine. I was there at ground zero for the Golden Age of children’s television when everything exploded; Sesame Street, Electric Company, all the Sid and Marty Krofft shows, Land of the Lost, Banana Splits—all that stuff and then all the Japanese shows when the Japanese shows started invading like Ultraman, Godzilla, Battle of the Planets, Johnny Sokko and His Flying Robot—all those shows which I think took it up a notch a little bit in a way than Speed Racer. There was so much attention to detail that you can tell the animated stuff that maybe the fluidity of the animation wasn’t as focused on as the attention to details. That’s like the Cantina in Star Wars. There’s something so charming and awesome about that because you know there was—those masks exist, you know that those costumes exist and I think when you try to fudge that, you lose them. You lose the emotion, and you lose, I think, care for what you’re watching. It’s the difference between the original Star Wars and Episode I. I think it just—technology in some ways made it colder and less easy to appreciate. I think that there’s something wonderful and tangible about a puppet or a guy in a suit versus CGI. There’s something incredibly charming about that that we took and made into Yo Gabba Gabba! So in some ways YYo Gabba Gabba! was a spinoff of The Aquabats Super Show! because we actually used characters from the Aquabats universe on that as our main characters on Yo Gabba Gabba! It’s that notion that the tangible rubber suits and miniatures and cars there’s a lot of care and there’s a lot of human energy that’s just put into making those things and it captures your imagination. There’s a room full of toys that people are playing with on a bigger scale that as a kid, just opens your eyes like, “That is amazing!” You know what I’m saying? It’s inspirational, like you want to do that. I want to do that. I’ve wanted to do that since I was a little kid. I think both pieces of work, you manage to capture the kids before they become cynical and can really buy into the magic of what you’re doing. Right. And I think you also give a little bit of a path when things aren’t exactly so realistic because sometimes in the quest to make things so realistic, you make them—you don’t care about them anymore. They become something that’s just like, “Oh well, I don’t care about that.” But when it’s kind of fake and a little unreal or you use forced perspective instead of the clean stream—especially for kids nowadays, they haven’t seen anything like this. Kids nowadays, they’re not growing up watching Godzilla; they’re growing up watching The Hulk or Iron Man movies where everything is CGI and it’s very realistic and really slick looking, but at the same time, it’s very cold. It’s very cold and they have to desaturate everything and make everything really a little muddy so that they can make things more realistic. Well, with this show, it’s almost like we put a spotlight on the zippers, you know what I mean? Like, “Check this out! This is a fakest monster costume ever, but look how awesome it is!” And I think kids will respond to it because they’ve never seen anything like that. And it looks so great, you know? Nostalgia can be very dangerous, except when it’s done right, and you guys have taken that and have turned it into something fresh and exciting. One of the things I thought was great in one of the episodes I saw was Rip Taylor’s cameo, which was obviously an homage to Sigmund and the Sea Monsters. And it was perfect—but I think a kid can appreciate because there’s a funny looking guy with a walrus moustache. That was all his costume and it was his idea too. He was like, “Okay, I’m a genie, but you can’t put anything on my head because I have a wig, and I want to take my wig off at some point and scare all the kids.” And he was incredible. He’s 80 something and he’s quick a whip. Super funny and that was a dream come true, too, like you said. 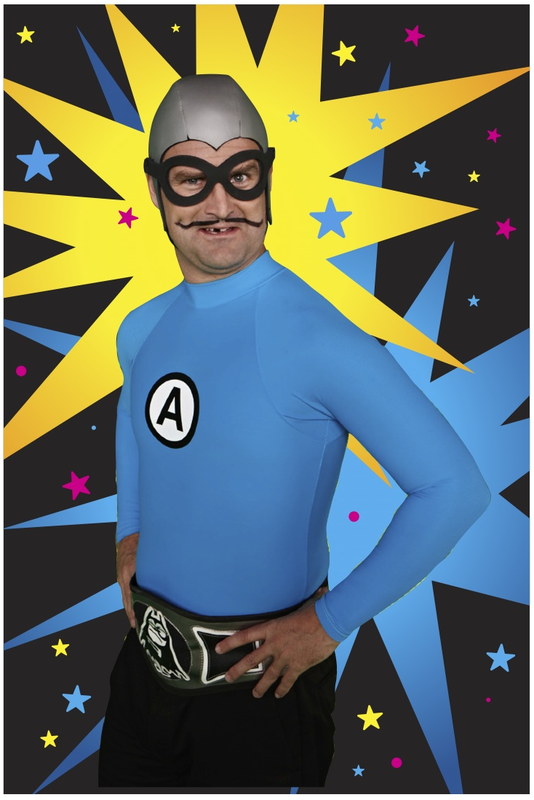 I grew up watching him as the genie on Sigmund and the Sea Monsters so to have him appear as a genie in The Aquabats show is like—that’s like a dream come true. And he was incredible, you know what I mean? Are there any other planned guest appearances of any other kind of old icons on the show? Yeah. We’re kind of straddling and that’s what we do on Yo Gabba Gabba! as well. We’ve got Biz Markie and Mark Mothersbaugh on Yo Gabba, but then we’ll have Cold War Kids or MGMT or these really young, new, fresh hip indie bands, and then we’ll have pioneers. So that’s kind of what we’re trying to do on the Aquabats show as well. We’re having Rip Taylor on the show, we have Lou Diamond Phillips is on an episode, and then we have John Heder from Napoleon Dynamite, we’ve got Weird Al, we’ve got just a bunch of young comic talent of Kate Towne and Paul Rust—young and up and coming indie comics we’ve been able to work with on the show as well. I’m leaving people out that I shouldn’t, but Sam Levine is on the show and there are a number of stunt casting things coming up for sure. Matt Chapman who is Strong Bad, and Home Star Runner who has been for years, he does a cameo on the show and he also directed a few episodes. So yeah, we’re working with a lot of young, hot talent, and then we’re also paying a ton of homage to the masters like Weird Al and Lou Diamond and Rip Taylor. It’ll be nice to see Adam West as an Aquabat. Yeah, we talked to Adam West at Comic Con and he’s really interested in coming on the show and we want to find the right role for him. I mean, if you’re gonna have Adam West on the show, you’ve got to have him in the right role. Sure. We’ll he’d be Aquabatman! (Laughing) Well, there you go! Or like somebody’s dad or something. We definitely want to bring him out. He’s a really great guy. He actually heard of the Aquabats before. I guess his daughter listened to the Aquabats in college or something. I really thought the structure of the show is really awesome with the alternate animated storyline and the parody commercials. Was this also part of the original kind of vision from the very beginning? I think that came along the way. The original vision was definitely to make this campy, live action throwback to the Land of the Lost, Danger Island, those kind of shows with Ultraman in there. So that was the original idea, but then as we actually started falling in love more and more with the magazine format of the show–which seemed to be a dead format for kids TV–as we were developing Yo Gabba Gabba! we really were also redeveloping The Aquabats show and adding in more like a magazine format. From my point of view, I’d love it if there were even more divergence and less time in the show that you’re not expecting. Hopefully if we get another season down the road or something, we can add more stuff in, but I love those kind of things. We have a lot of stuff that we do at our live shows as well like we’ll stop in the middle of a song and they’ll do, “The Aquabats will be right back,” and then they’ll have a fake commercial in the middle of a live concert, That’s something that lends to our whole vibe, for sure. You and Chad Larson are the co-founders and actually the only two original members still in the band. How does one prepare themselves to become an Aquabat? Oh, man. They just have to go into the woods and punch a tree for a few days and really bang their head against a rock for a week. I think we just prepare for it not to be easy. It hasn’t been easy at all. Again, it’s been 16 years since we started the band and it’s been an uphill battle. It gets tough and there’s been really lows and super highs. We’ve been really excited and stoked and those highs—they’ve never been economic highs; they’ve always been just great feelings, and we get great feelings, and we have great fans and we—the people that have supported us and stood by us for so many years, that they’re just kind of awesome kids, and we have a lot of fans working on the show like as PA’s or doing effects, or people that we’re working with that went to our shows years and years ago and . . . It’s a really cool community. So everyone’s pretty much a veteran at this point of the band. There’s not really any rookies. I think that’s just a thing about becoming part of the group is just being able to hang in there and keep doing it, and we go out and play shows and it’s awesome because it renews our faith in the band because of the kids and the support we get from our fans. It’s just—that’s what’s kept us going for sure. If the series is a hit, are there plans to kind of do stage shows à la Yo Gabba Gabba!? Yeah! I’d love to do—I’d love to bring a lot more production into The Aquabats show, but what I’d really love to do is keep the show small and just do more shows like keep the venues—I don’t want to move to stadiums, I don’t want to move to larger venues. I’d like to stay at the same size venue and then just play a couple days in a row and actually enjoy the city that we play, that we’re staying at or something, and I’d love to bring families into small intimate venues where I’d be able to shake everybody’s hands and meet everybody. There’s something awesome about playing at smaller venues because you get to literally reach out and grab everybody, and people are grabbing you while you’re jumping around and tripping you while you’re trying to dance. There’s something really cool about that. That’s pretty punk rock and it’s just awesome to get out to these small venues and then see families there with young kids and dads crowd surfing with their four year olds. It’s awesome, it’s cool. I’ve never been worried about that because I’ll see everyone at shows–at least at our shows, and they’re all there for the same reason, and that’s to have a good time and do something positive and exciting. So I can’t wait to have the show debut and then go out and play some shows and introduce our live show to more people. The Aquabats! Super Show! premieres Saturday, March 3rd at 11 AM/EST on The Hub. For more details, visit the Aquabats on The Hub site, on Facebook and at their own Official Site.